Seung Ah, what made you want to be a professional storyteller? 2007 and 2009 were the most important years to me. Until 2009 I didn’t know what motivated me to become a storyteller. This was the year my grandmother passed away. After her death, I realized that she had been my first storyteller. She told me tons of stories to soothe my crying and that her stories are a heritage of her love. I felt then that I was destined to become a storyteller. 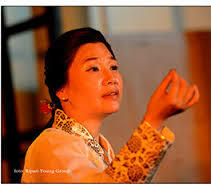 I founded ‘Arirang Storytelling Concert’ in memory of my grandmother after she passed away. Whenever I tell stories she taught me, she remains alive in my heart. Telling stories is the only way I can meet my grandmother. So my path to become a storyteller began when I was born as a granddaughter of my grandmother. What is the cultural role of storytelling in Korea? I think there are two cultural roles of storytelling in Korea. First one is to build cultural bridges between Korea and other countries. Nowadays because of K-pop and K-drama people around the world are becoming more aware about Korean culture. People want to learn more about Korean culture and what they want to know. But how? My “Arirang Storytelling Concert” has been one of the ways for people to get more information and understanding about Korean culture. It is said as an introduction of understanding Korean culture and a kind of edutainment program. Once you think something is easy and fun, the more you will be interested in it. 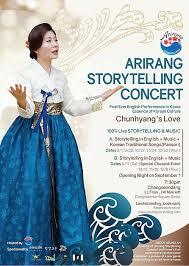 “Arirang Storytelling Concert” can be a good motivation to learn and know more about Korean culture. 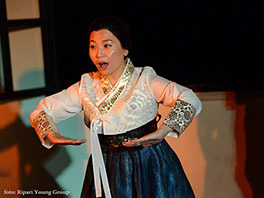 Second, Korean people started to see the value of Korean traditional culture by watching that I have been working on pansori, Korean traditional musical storytelling originated in the 17th century into a pansori storytelling concert, which is combined with western storytelling. We have so many stories throughout 5000 year old history. In modern society of Korea forgot those treasures our ancestors have given to us. How is it the same/different as other places? Storytelling has been different in Korea in many ways. People use it more as a tool of language education for kids not for adults. Also it is meant more about writing fields. I started to introduce storytelling as an oral literature and an art form to Korean people. What are the differences in telling a personal story vs. telling a traditional story? To me they are the same. I always weave my personal story into a traditional story. I always connect my personal story with a traditional story. I choose my stories I mean traditional stories with a very very personal reason. Each time I choose each story for a special reason. For example after my grandmother passed away I chose Chunhyang’s story because it was her favorite story. Also Chnhyang was me who had kept on her way with strong will. The reason why I worked on Heungbu’s story is because through it I learned how to forgive somebody who hadn’t been nice to me. The Snake Bridegroom story is my real love story. And Simcheong’s story is about the relationship between my father and me also Korea and me. How do you see your relationship with earlier generations of storytellers? I deeply believe that through stories we can feed our soul. Our happy soul can enrich our life. As a storyteller I found that pansori stories are an exquisite way to learn more about how human beings express their feelings. 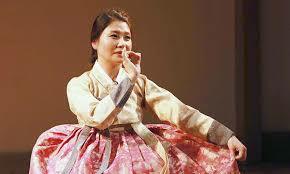 For example traditional pansori can take from 3 to 9 hours to perform one story. In Chunhyangga the ‘separation’ song lasts 40 minutes. It shows the range of feelings experienced when having to say goodbye to the one you love the most. Through that stories I learn the life and wisdom of our ancestors which reflect all human beings’ life. What are the benefits in sharing stories between cultures? Sharing stories between cultures is like a magic. We become one through stories. We become brave to learn other cultures without fear. It is power of love. It is like love beyond borders. Now with the help of economic growth in Korea more people from other countries have been coming to Korea. I have been telling them Korean folktales as well as their own folktales. They really appreciate that I told them their folktale which they heard from their mother or their grandmother. Then they were inspired to learn more about Korean culture to share. Also I have been teaching them Korean folktales and they told Korean people a Korean tale they have learned from me. And my Korean friends were so touched by it so they started to learn more about other culture to share. How do you prepare for telling a story? While working on the “Arirang Storytelling Concert” project, I found myself acting not only as a storyteller, but also as a director. Maybe I am a Korean storyteller who loves Korean stories, and at the same time I am a Korean Culture Storytelling director. As a storyteller I am careful when I chose stories. As a director I am very careful with the balance and harmony of storytelling and the integration with the Korean traditional performance. Also, I tell the story of the performers. To me the entire process seems like alchemy. To alchemist all elements are very very important to make the ‘magic’ happen. To find the best ingredients and to mix them according to the right portion. Also personally choosing and preparing a story is my sacred journey. Through the process I have learned more about myself and found many solutions in my life.